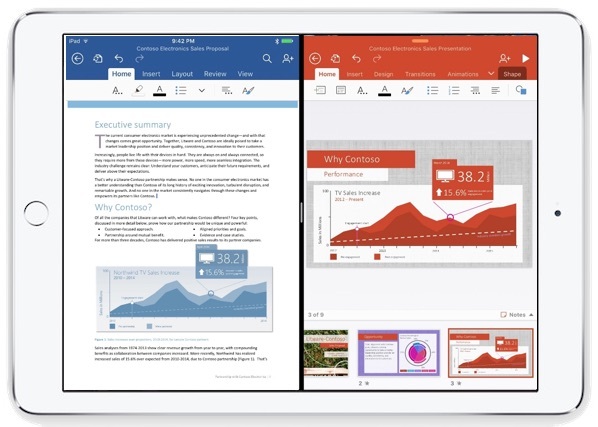 The latest versions of iOS for iPad include a great multitasking feature called Split View, which, much as it sounds, allows users to split the screen on the iPad between two active apps side-by-side. iPad and iPad Pro users can adjust the size of each app panel or have them take up an equal amount of space, enabling users to essentially use two apps at the same time. That’s how you enter apps into Split View on the iPad, it’s pretty easy. The feature really shines on iPad Pro with its large screen, particularly with productivity apps and when an external keyboard is in use, since an external keyboard opens up even more screen real estate (and typing on one is easier anyway for most humans). 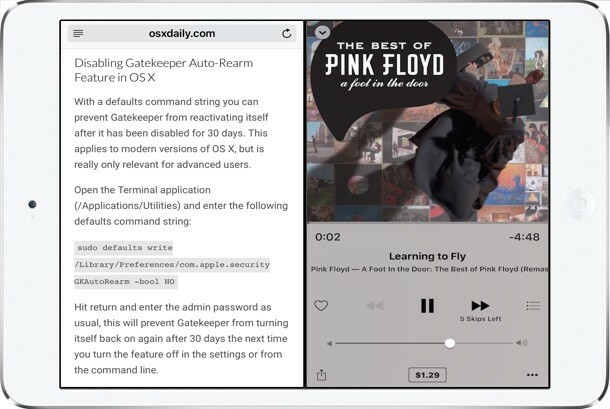 This multitasking split screen feature is only available on the newest iOS releases and latest iPad models, including iPad Air 2, iPad Mini 4, and iPad Pro and anything with iOS 9 or later. The iPad Mini series is missing the Split View feature presumably due to the smaller screen size of that device, and though older iPad models could perhaps support Split View, at the moment they do not have the feature available. Mac users will find Split View on the iPad is quite similar to Split View in macOS X, though one could argue that the Mac has less necessity of split screening apps given the longstanding ability for Mac OS to multitask with many apps on screen at once, an experience which is typical and expected on a desktop and laptop computer, but that is just now arriving to the tablet world and iOS. Split View and Slide Over are just two of the great new multitasking features available to iPad users with the latest versions of iOS. Another great multitasking trick is using Picture in Picture mode on iPad, which allows you to hover a floating video window over other active apps so that you can watch movies or video streams while doing other work. Split View, like Slide Over and Picture in Picture, is really one of those features you have to try out yourself. Do keep in mind the hardware and iOS limitations for this feature however, and it’s possible that if you aren’t finding Split View to work at all on your iPad, that it’s simply not a new enough model fro Apple to support split screen apps with. The iPad Mini 4 has split view too- you might want to add it to the article. Yup you’re right, added! Thanks for pointing that out. You can also use Multitasking with Picture in Picture mode, which is sort of useful for watching games while browsing the web on iPad, but for someone like myself and other technically deep peoples, the iPad has so many limitations. 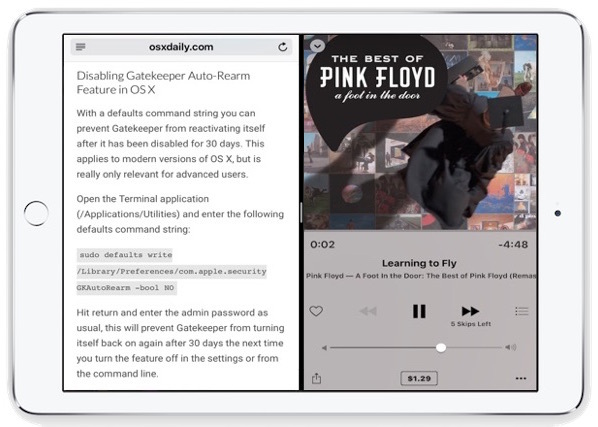 Yes, Multitasking on the iPad is ok, and on iPad Pro it is pretty good, but it’s still an iPad, meaning it’s a simplified computer for your grandparents, your young kids, and your web browsing on the couch. I guess you can do basic emails, banking, simple games, and stuff from it too, and yea you can sketch and what not, but it’s not a much of a creation or productivity device and trying to make it one is a stretch of intentions. This is why I say it’s for your grandparents, your parents, your kids, and your couch, it’s not for your office, and it’s not for your workstation. Anyone struggling to make it into a desktop computer or laptop replacement is doing just that, struggling. Just get a Mac for those purposes, for the price you will get much more utility and much more functionality. And it won’t tank performance with a software update like Apple does with iOS on an annual basis. If you knew how many professional people use the iPad, plus all of those who use it to do things you can’t do on a laptop, you wouldn’t come out with such simplistic, unaware patronising, old fashioned nonsense. Does it work only with Apple apps? I’d like to try Scrabble in split view, but not among the options. We’ve got an iPad Air (the second one) with iOS 9, but swiping only does “Slide Over”, as Apple seems to call it. The separator between the two apps never shows up, so the other application stays in a small portion of the screen, and the first application is not accessible, defeating the idea of multi-tasking. Any idea why? It is worth noticing that some apps do not support split mode, disabling it effectively. They may support split in some future update. For me it is Shredder chess that cannot run beside of iBooks. This has been something I was looking for tu study chess games from books while playing them in Shredder. What works is Slide Over, but it is not an ideal solution. I don’t get a choice for the second app. It’s always Photos. I can’t see any way to change it. So far, it’s a nuisance that keeps opening Photos by mistake if my typing extends too far to right side of the screen. There is a swipe down at the top of the right pane. However, it only gives you a limited subset of split-screen “shareable” apps. I have an iPad 2 years old (model MC705B/A) with IOS 9.1 but I can’t get this to work at all. the right to left swiping does not work. Can I use this feature with this iPad and this version of iOS. please don’t suggest I download a newer version because each time I upgrade software I have to take iPad (and iPhone) back to factory settings. The Apple help page states that the slide over only works with iPad Pro, iPad Air 2 or iPad mini 4. This article states iPad which leads to confusion, as I have an iPad 2 also (as Sue) and this feature does not work (as Sue stated) on an older iPad. OS X Daily you should post a correction / clarification. Thank you Theo Vosse for the link to the Apple help page. Reading can be difficult, it requires attention concentrated for minutes at a time, and yes people get excited and don’t want to read in this generation of kids. But reading remains essential if you wish to understand the world! Apps need to be coded for split view/multitasking, it doesn’t just work with everything unfortunately. Ah, but the apps that do are pretty cool! Can the multi tasking be switched to the left side of the iPad? I’m left handed and it would be easier for me to write with the pen on the left side. I tried to go to the multitasking settings but I didn’t see an option. I just want to make sure that I didn’t miss a setting somewhere.